GARETH L. POWELL is an award-winning writer from the UK. He is the author of the novels Silversands, The Recollection, Ack-Ack Macaque, Hive Monkey and Macaque Attack. His alternate history thriller, Ack-Ack Macaque, won the 2013 BSFA (British Science Fiction Association) Award for Best Novel, and his story, ‘Ride The Blue Horse’, is currently shortlisted for the 2015 BSFA Award, in the short fiction category. In addition to winning the BSFA Award, Ack-Ack Macaque has also been published in Japan by Tokyo Sogensha; Fantasy Book Reviews placed it at #40 in their list of Top 100 Fantasy Books; and it has also inspired a comic strip, fan art, graffiti murals, a pop song, and at least one tattoo. In 2011, The Guardian review of Gareth’s second novel, The Recollection, insisted that, “If you only read one space opera this year, it’s got to be The Recollection.” The book went on to be translated and published in Germany by Heyne (a division of Random House) under the title Sternentor. He is currently working on his sixth novel. 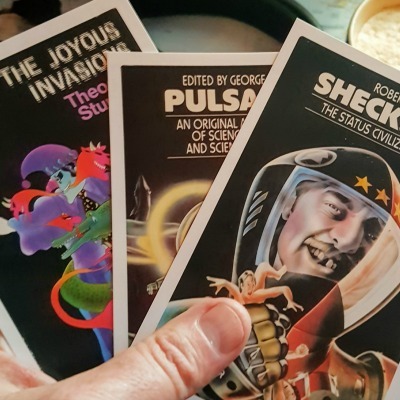 Gareth’s short stories have appeared in a host of magazines and anthologies, including Interzone, Solaris Rising 3, and The Year’s Best Science Fiction. Many of his stories have been brought together in the collections, The Last Reef (2008) and The New Ships (coming 2017). The Guardian says, “Powell draws his characters with fine brushstrokes.” SF Book Reviews places him, “at the forefront of science fiction,” and Gutenberg’s Son writes that he, “has managed to find the balance between thoughtful existentialism and pulp adventure. In addition to his fiction, Gareth has penned a strip for the long-running British comic, 2000 AD, and has written articles and reviews for The Irish Times, Acoustic Magazine, and SFX. In the early 1990s, Gareth studied creative writing at the University of Glamorgan. He has since run a genre fiction workshop at Aberystwyth University and given guest lectures on creative writing at Bath Spa Uni. He is also a popular panelist and speaker at literary events and conventions, and was a guest of honour at BristolCon in 2012. He is a frequent guest on local radio, and has appeared on the BBC Radio 4 Today Programme. Discuss this story and episode on our forums. Interview: Zak Wilson Find out what it’s like to live on Mars for 8 months! Nikolle is a writer and a voice actor. Her fiction, poetry, and plays have been published and presented; and her voice has appeared in various mediums. Nikolle has performed numerous narrations for a number of popular and award-winning podcasts, such as: The NoSleep Podcast, Far-Fetched Fables, and Tales to Terrify. She also narrates classic literature in her own podcast Audio Literature Odyssey. To learn more about Nikolle, visit her website at nikolledoolin.com.